Multi-vari studies are methods used in the beginning of the ANALYZE phase to reduce the focus from all inputs (x's) creating the variation to a much smaller group of variables. The FOV tree can literally go down to an nearly infinite level. Use Multi-vari studies among the FOV's to find specific areas to hone in. Take this example below. The MSA has passed at this point and the Study Variation has been quantified. The remaining variation of the total is related to the PROCESS. Within the process, the team found came up with 5 sources of variation to examine. The GB/BB then ran Multi-Vari charts with ANOVA tests on four of the sources and used F-test and 2 sample t-test on another source. From here the data found a significant source of variation from Plant to Plant. Within that, it was found that Plant C was highest contributor to variation. The GB/BB continued to mine the data further to examine the same original FOV's with only Plant C. At this point, the GB/BB may have found that certain machines, operators, a particular part, or a shift was the primary contributor. Recall, the focus of Six Sigma is on VARIATION reduction, not only shifting the mean. This could even result is slightly reducing the performance of the mean if it results in drastically reduced variation. If there was Machine A that ran an average of 23,492 pcs/hr with a standard deviation of 4891 pcs/hr and Machine B that ran an average of 23,400 pcs/hr with a standard deviation of 10 pcs/hr then the latter is probably preferred. Although both are important the team's goal is to stabilize and make the process more repeatable, controlled, and predictable before trying to shift the mean to a more desirable target. In other words, make the process more PRECISE before making the process more ACCURATE but ultimately both are desired. Almost every set long term data contains rational subgroups. It is very important that a GB/BB understands how to dissect the data to understand the variation created by the families of variation. Remember, by this stage the Measurement System variation has been quantified and the remaining variation is the Process Variation. Each subgroup being analyzed contributes to the total Process Variation. The key is to analyze the FOV to identify the vital few inputs (KPIV's) that are creating most of the process variation. Quantifying and visually showing the team members the magnitude of the variation created by each of the subgroups is extremely relevant to the team so they can focus on right areas to reduce variation and improve the mean. Frequently it isn't as simple as that and variables can interaction and confounding effects on one another where a DOE becomes important. These charts are a graphical method of presenting ANOVA (analysis of variance) data in comprehensive visual manner. 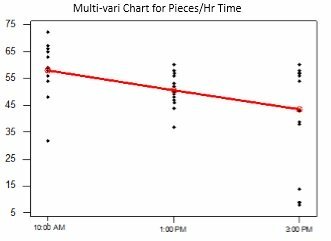 These charts are often used to gain a qualitative understanding of the input (x's) contributions on the process and interactions of the inputs prior to more time consuming numerical analysis. Team members tend to find these charts easier to grasp than statistical results and often have a deeper level of interest in the data when it is presented in this format. The chart displays the means at each factor level for every factor but also show the spread of the data. Multi-vari charts are a graphical representation of potential Key Process Input Variables (KPIV) and their relationship to the Effects (Y's). They are used to drill down into the "vital few" inputs that are creating most of the variation and then the team can focus on the highest impact improvements. The charts display data of each factor and the various levels for each factor. Material - variation from Suppliers, Lot, Heat, Spool, Roll, etc. It is not so important to categorize into one of the four above (there are others) but more important to recognize and study the sources of variation in as many ways as possible. 1) Create the Families of Variation tree (which are rational sub-groups making up the Process Variation). Determine which rational subgroups that will show relationships and interactions of the key inputs. 2) Use as many graphical techniques as possible, within reason, to illustrate sources of variation (such as Boxplots, Scatter Plots, and Multi-Vari charts). 3) Consider the three sources of variation shown above and create Multi-Vari charts for all of three. This will eliminate subjective reasons or validate them and help to show relative impact of the sources. This helps a GB/BB narrow their statistical tests to a smaller set of variables. 4) Collect the data on the rational sub-groups shown in the first step. A good sampling plan ensures that a broad spectrum of data is collected that includes relevant sources of variation noise. In other words, collected data on several lots, batches, shifts, machines, tools, etc. Depending on how easy and economical the data can be collected, strive to get as much as possible within each rational subgroup. 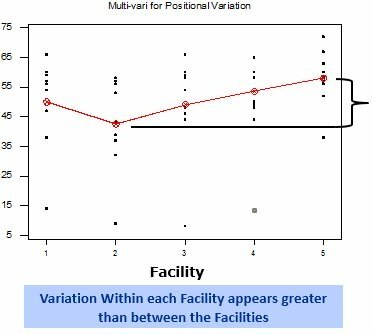 The chart below helps visualize the relative consistent from facility-to-facility but the variation is wide within each facility. The variation among facilities appears to be less of a concern (see the spread of the red line) than the variation within some of the facilities (see the spread of the data points within each facility). 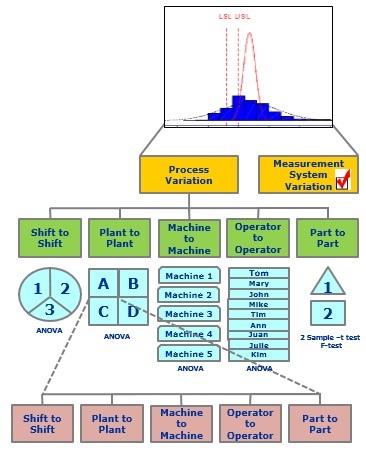 ANOVA will quantify the variation between facilities and within facilities to confirm the graph. The graph is more powerful to show the team, the statistics are your friend as the proof. An F-value of the Facilities that is below the F-critical value indicates the variation within the Facilities is greater than the variation between them. The opposite is true if the F-value is greater than the F-critical value. A more discriminate investigation of positional variation may include examining mold-mold variation within a particular facility, or press-press variation within a particular facility. 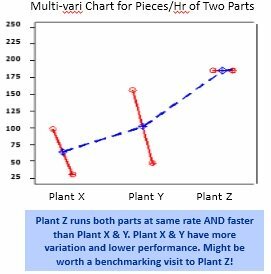 There are 3 factors (Plant X, Y, and Z) and 2 levels (Part 1 and Part 2). The y-axis is the pieces/hr that each parts ran at (the output) at the respective plants. The blue dots are the mean values (in pieces/hr) of the two parts at each plant. Click here to download a presentation that goes into greater depth on multivariate analysis (other topics are also available). Multi-vari studies have limitations as do most tools. Understanding these and the pitfalls within each tool are important for a GB/BB. Confounding of input is present or multicollinearity. A DOE should be performed to further examine the interactions of the inputs. Interactions may exist within the data but are not shown with studying one "x" at a time. The data collected may be too narrow of a range and not represent all the proper input "x's" behaviors that influence "Y", the output.